If you have ever lifted your arms in wonder, spun around to greet someone you love, skipped across a lawn, or even lit up with a smile, you know the thrill of movement and more: You know the joy of dancing your prayers. Your body is a vehicle for expressing all manner of spiritual practices, from wonder to peace, grace to reverence, play to beauty, yearning to loving. This is true no matter what the abilities of your body and no matter what you have been led to believe about your limitations. In this e-course, we will start gently with the ground beneath our feet and samplers from some of the world's sacred dance traditions. 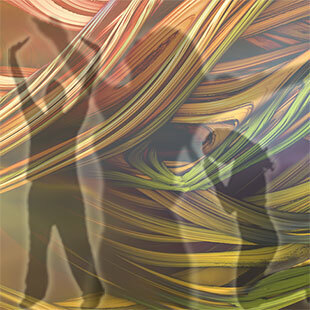 We will explore the role that movement plays in worship and conclude with suggestions for a personal movement practice. Throughout our time together we will be stretching into our body's marvelous ability for prayer in motion. Everyone is welcome, at any level of mobility. Our guides for this retreat have been best friends for nearly 40 years, during which time they have danced, walked, prayed, cried, advocated for peace, and laughed heartily together. Lindsay's life is woven around spirit and community, with threads of varied vocations: editor and writer for Sojourners magazine and other publications, Montessori educator, administrative coordinator, and chief herder for Rolling Ridge Study Retreat and Friends of Silence. She has been a dance artist with modern and liturgical dance companies, and has led numerous retreats weaving spirituality, movement, ritual, silence, and the natural world. Patricia studied liturgical dance with Lindsay while they were part of Sojourners community. Her insights into gratitude, grief, and reverence have reached thousands through the online vehicles of Gratefulness.org and Cornell University’s “Dear Uncle Ezra” column, a forerunner in online counseling. She has led several Spirituality & Practice e-courses, including "Creating Sanctuary for Ourselves and Others" with Terry Hershey and "Living the Hours." Her most recent experience in sacred movement is Sufi whirling in the United States and abroad.